There will be 15 restaurants and bars aboard Explorer Dream. Among these are some of the Dream signature options that have appeared on Genting Dream and World Dream, such as the fancy Chinese restaurant Silk Road and al fresco Hotpot. Japanese Umi Uma, South East Asian Blue Lagooon, The Lido and Seafood Grill by Australian chef Mark Best will also feature. But newcomers include Mozzarella Ristorante e Pizzeria, described as a 'modern fusion' of classic Italian dishes and pizzas with a Japanese twist. There will also be an EAST and WEST dining room. There will be 926 cabins aboard World Dream: these will include Interior Staterooms, Oceanview Staterooms, Balcony Staterooms, Palace Suites, Palace Deluxe Suites, Palace Penthouse and Palace Villa. The Palace options are part of a private luxury enclave featuring 50 suites and a butler service as well as separate facilities. The main attraction on the top deck is the Roman-themed Parthenon Pool deck with Caesar's Slide, hot tubs, a stage for live bands and an LED screen. The ship's peacock-inspired Zodiac Theatre will offer Broadway-style live shows. Then there's the ESC Experience Club for Virtual Reality thrills and the Action Zone for more conventional gaming. And, of course, there is a casino. If pampering is more your thing, you can indulge in spa treatments at the Crystal Life Spa. There is also a gym, jogging track and sportsplex for those who prefer to stay active. Families will gravitate towards the Parthenon Pool on the main top deck, which comes complete with a waterslide. Other kid-friendly features include the ESC Experience Club where you can play a range of virtual reality games. Then there's the Action Zone, which is described as a 'multipurpose' lounge featuring games consoles. There will be a Sportsplex where families can play games like football and basketball together, and also a Little Dreamers Club where kids can enjoy games, workshops, costume parties and even a DJ booth. Six one week Queensland and the Barrier Reef Cruises, starting October 27, 2019, calling at Mooloolaba/Sunshine Coast, Brisbane, Newcastle and Gladstone. 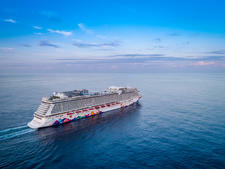 Eight one-week Tasmania Island and Melbourne Cruises, starting February 9, 2020, calling at Port Arthur, Hobart, Burnie, Melbourne, Phillip Island and Eden. Seven one-week North and South New Zealand Cruises starting mid-December calling at Wellington, Milford Sound/Doubtful Sound, Dunedin, Napier, Bay of Islands, Akaroa, Picton, and Gisborne. 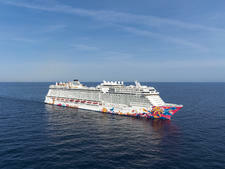 Genting Dream debuted in November 2016, becoming the first ship built under Genting Hong Kong's premium cruise line brand Dream Cruises.